The headline above is a slogan used by a number of different state-run lotteries in the United States. It’s a truism of sorts — the statement is obviously correct (both in the context of lotteries and more generally) and says nothing really interesting, but it makes for good ad copy. You’d be hard pressed to find a person who thinks that he or she could, somehow, win the lottery without first buying a lottery ticket or the equivalent. In fact, you could say your odds of finding such a person are close to zero — perhaps as low as winning the lottery itself. 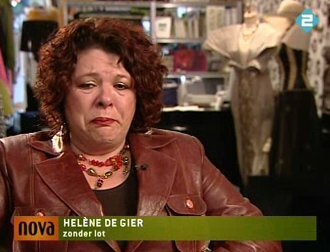 The person pictured above is named Helene de Gier. She’s Dutch, and she didn’t win the lottery, even though she would have had she bought a ticket. We know that — and she knows that — because her neighbors won. Not just her next door neighbors, either, but seven different households who live nearby. That wasn’t some weird fluke of luck — well, no more so than winning the lottery in the first place is a fluke of luck — but rather a byproduct of how this particular lottery worked. The Netherlands has something called the “National Postcode Lottery,” which, like most lotteries, is a government-run scheme to raise money earmarked for various charities or public services. But what makes it different is that the winning numbers are based on where you already live. Every so often, lottery officials pull a postal code out of a hat (proverbially; it may be a bucket or, for that matter, be generated by a computer) and anyone with that postal code splits the jackpot. There’s only one catch: you have to buy your way in. Tickets, a decade ago at least, cost 8.50 Euro — and you can’t win if you don’t play. She says that she became obsessed with the lottery, and was confronted with her loss every time she had to write her address. [Further,] in a TV interview she tearfully recounted how she came to dread the next lottery draw, which “felt like a noose around my neck being tightened.” And she said this lottery was not any ordinary game of chance. “In other lotteries you would never know for sure that if you had only participated you would have won,” she insisted. Unable to cope, she decided to win the lottery. As that would be nearly hopeless, she decided to simply sue, an endeavor which is also nearly hopeless, but in her defense probably had better odds. Her lawsuit had three main points, as reported by legal blog Lowering the Bar. First, she argued that the lottery itself was an invasion of her privacy; “the media descended on her postal zone, which she could not escape.” Second, she claimed that the lottery’s advertisements were tantamount to “emotional blackmail” — the ads “emphasize the regret one will feel if one’s neighbors win but one does not because one did not enter” (which she knew all too well). And finally, she complained that her rich neighbors were rubbing in their success — one had the audacity to buy a Porsche and park it outside his house — causing her emotional harm such as the awfulness summarized above. For those reasons, she argued, the court should order the government to give her a jackpot of her own. The court wasn’t convinced, and she lost. But at least, this time, she played. Bonus Fact: In January of 1997, a Los Angeles woman named Denise Rossi filed for divorce from her husband of 25 years, Thomas. Thomas Rossi was surprised, to say the least, but he soon found out why his longtime wife no longer wanted to be married to him. Less than two weeks earlier, Denise won $1.3 million in the state lottery. She hid that fact during the divorce proceedings, hoping that by doing so, she wouldn’t have to share the windfall. Unfortunately for her, as the Los Angeles Times reported, her ploy backfired. The family court judge ruled that, by hiding her winnings, she had violated the state’s laws requiring that parties to a divorce disclose all assets. As a penalty, the judge awarded the entire $1.3 million to Thomas Rossi. From the Archives: The Loneliest Number: Another time when lots of people in town won the lottery, but alas, not everyone had bought a ticket. Take the Quiz: Name the capitals closest to Amsterdam. Related: Fake lottery tickets. If you play, you’ll win, but you’ll really lose.